The PS3 is outselling the Xbox One. We already know the Xbox One isn’t a huge seller over in Japan. However, after their impressive showing at E3, and a summer full of games on the horizon, you’d think that maybe some Japanese consumers would be interested in purchasing the next-gen console, right? Right? As it turns out, the answer is no. Via Media Create, a website that tracks hardware sales in Japan, during the week of June 8 – June 14, the Xbox One sold 100 units in Japan. That isn’t a typo. It only sold 100 units. For comparison sake, the PlayStation 3 managed to sell 2,633 units, selling more than 2ox the amount of systems. We knew the Xbox One had a poor market in Japan, but this is just a brand new low. 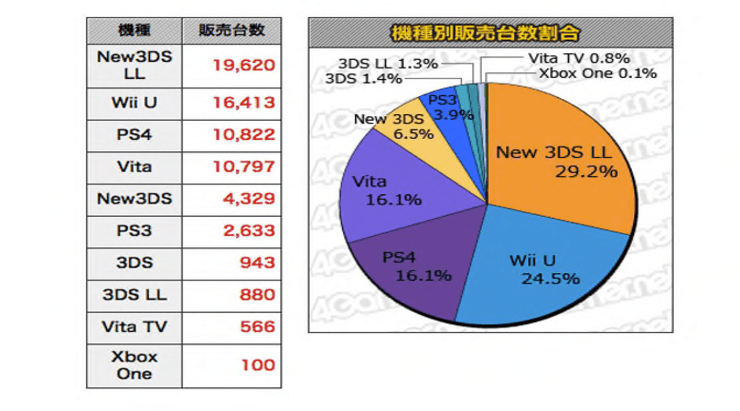 You could chalk this up to a myriad of things; the Xbox always seems to sell poorly in Japan, and mobile/handheld gaming is a much larger business there (just look at the 3DS sales topping the charts), but it is almost never acceptable to have only a 0.01% sales rate for a week.